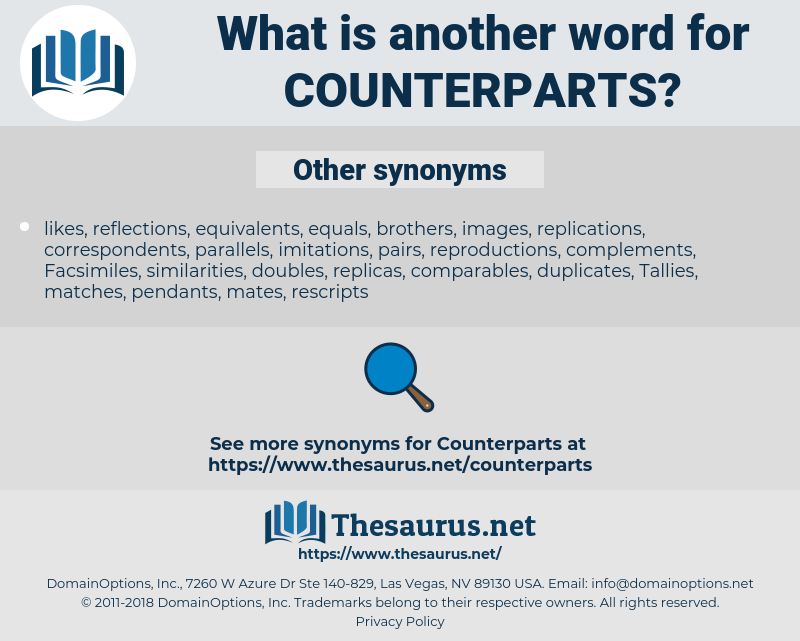 What is another word for counterparts? 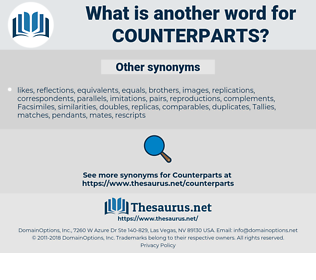 counter-parts, contemporaries, co-operation, cooperation, correspondents, commentators, Telecommunications, Countrymen, correspondence, communicators, commensurate, companions, competitors, concurrents, corporations, co-sponsors, countermeasures, compatriots, representatives, practitioners, collaborators, authorities, reactions, compensations, neighbours, considerations, partner, partners, co-workers, protagonists, Constituencies, congeners, parallels, comrades, constituents, parliamentarians, Consulted, entrepreneurs, Opportunities, contributors, corresponding, opponents, competing, regulators, contributions, producteurs, senators, respectively, coileagues, contractors, enterpreneurs, complaints, delegations, negotiators, accomplices, fellow-citizens, experts, partenaires, Spokesmen, pairings, organisations, conspecifics, co-chairs, contacts, Countries, partnerships, analogues, returns, schoolmates, perpetrators, Operators, pairs, Sports, committees, ombudspersons, Copies, participants, supporters, team-mates, responses, contents, newcomers, structures, advocates, contestants, brethren, brothers, contenders, commissions, products, sectors, pares, Companies, homologues, producers, parliaments, rivals, versions, trade-offs, associates, Specialists, endeavours, leaders, dealings, actors, parts, institutions, exchanges, coworkers, Branches, audiences, locations, accordingly, allies, Undertakings, neighbors, businessmen, entreprises, Organizations, classmates, youngsters, departments, sponsors, alternatives, Negotiations, personnel, establishments, Respondents, professionals, mates, instructors, editions, Nurses, demonstrators, Entities, proposals, emoluments, agents, rates, approaches, friend, Friends, mediators, regions, pals, Agencies, responsible, schoolchildren, assets, troops, ventures, traders, organs, attendees, protestors, equivalencies, executives, distributors, concerned, banks, teammates, trainees, quarters, Cronies, facilitators, Relatives, affiliates, talks, customs, Torques, exporters, playmates, remains, delegates, substitutes, Securities, teachers, catalogues, earrings, ombudsmen, colleges, shipmates, values, premises, Dignitaries, entrants, others, machines, sources, Marines, officials, speakers, analogs, Intermediaries, protesters, responders, NGOS, Accessories, handlers, Adversaries, Charities, jeunes, fellows, scholars, fellow-meps, trades, seniors, Incomes, role, Roles, interveners, forces, employers, Gentlemen, players, servants, labourers, airlines, inmates, interviewees, fellow-members, eyes, organisms, citizens, Areas, panellists, stays, services, claimants, overseas, retailers, assistants, informants, Varieties, providers, stakeholders, juveniles, dealers, makers, suits, Males, intervenors, letters, lawmakers, Possibilities, Towards, HOMOLOGS, Facilities, vouchers, Strains, tenders, learners, Firemen, employees, Persons, dispensers, Those, boards, Industries, drafts, gangs, mps, Soldiers, offsets, mainland, armies, releases, femmes, match, bonds, hommes, During, points, Carriers, peers, Females, host, hosts, rest, Universities, young, like, Students, observers, FTES, enterprises, celles, Families, homologous, farmers, workers, clerks, Rewards, ministries, callers, MEPS, kids, folks, flats, women, lineages, members, Clients, Bodies, leads, sets, Businesses, movement, health, sides, youth, Youths, boys, Forms, Parties, numbers, people, inland, NATIONALS, growers, officers, men, rural, offices, militant, invalids, Salaries, lakes, Ones, Children, Firms, militaries, guys, Pupils, Disabilities, Wives, individuals, stay, buddies, D, ages, 58, LINEs, units. And will you stop in England, and bring home the author of " Counterparts" with you? The twelve representative gems within the cold stratas of matter, stand as the material representatives of their stellar counterparts in the sky, and constitute the beautiful, glittering, but crystallized, Zodiac of man's physical anatomy.